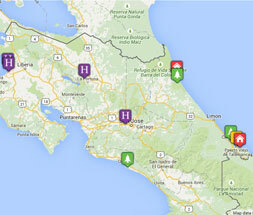 Tribes Overall: "We loved Costa Rica - a beautiful country, lovely people and great for nature lovers." Tribes Service: "We thought it was very good, all the pick ups were punctual, the itinerary varied. We loved the Vamoos app which kept everything together and gave us a means of recording the names of wildlife as we were going along." Guides: "We had a number of guides and they spoke good English, were polite, friendly, funny and knew their stuff! Some carried telescopic lenses which really helped us see the wildlife and they were happy for photos to be taken through their equipment. They all had a passion but we particularly liked Alan, the guide in Manuel Antonio who has a real sense of responsibility for the National Park, even picking up litter and telling a lady off who was about to try and feed a monkey." Social & Environmental Responsibility: "We certainly learnt a lot about protecting the environment and were impressed that some hotels has recycle bins in the rooms as well as normal refuse. One even had a compostable bin (Trapp Family Lodge). All the guides focused on educating us about the wildlife, the natural environment and their pride in their country was tangible." You really feel part of the rainforest here (and boy did it rain!) with wildlife on your doorstep. Loved the river trip and visit to Tortuguero from here. The food was typically Costa Rican which was fine but meals did seem hurried and after 8pm they were obviously waiting to close. Had some nice cocktails in the upstairs bar though. Very nice hotel in centre of San Jose, close to the cathedral and theatre square. Nice small bar with garden area. Only spent one night here so didn't use restaurant. Our favourite hotel, beautiful room with a view to the volcano. The food was excellent, the nature walk at the back was lovely - we saw a family of coatis. The staff were very friendly and the pool area was nice - although we stuck to the warm jacuzzi as pool itself was freezing! High up in the cloud forest, it was within walking distance of the national park but isolated from anywhere else without a taxi ride. It was very windy and there's no double glazing (I wouldn't expect it) which meant we didn't sleep very well at all as cold and noisy. The restaurant meals were excellent but we found the breakfasts, served in a different room to be very basic and not much variety. Lovely room which blended in with the natural environment. We were woken early each morning by the howler monkeys and there were agoutis, frogs and lots of different birds within feet of our lodge. A short walk down the drive takes you to the beautiful caribbean sea. "We loved the abundant wildlife, some of which was actually seen more easily from the hotels than in the national parks. Loved the people, very genuinely friendly and helpful. It was my birthday while we were there and the waiter brought an impromptu birthday cake with candle!"